This Thursday, March 8th, 2018 will mark my fifth year facilitating a live a Twitter chat. The topics have evolved in that time from the first chat focused on #GunControlPolicy in the wake of the Newtown Incident to Economic Inequality. This Thursday I will be once again facilitating the chat on Economic Inequality in partnership with the folks at #MacroSW and hope that you will all join us. You can find out more about the chat, which also uses the Film Inequality for All as a centerpiece for discussion, by visiting macrosw.com. Looking back over the past five years I have been wondering what this conversation has actually accomplished? Dr. Laurel Hitchcock and I have published some findings in Social Work Education: The International Journal, which demonstrates that students do benefit from the Live chats. However, I can’t help but feel like the discourse in the United States has changed, in part because of social media and in part because of our current state of affairs. I think it is telling that the first chat was centered on Gun Control Policy and here five years later there has been little to no progress on that front. As social workers, even as a society I think we should be able to do better. This does not imply that having a discussion, whether on Twitter or some other form, is ineffective. Rather, I think it points to the fact that we should be discussing more and that we should be trying harder to implement positive social change. I would say that we are doing better in having the discussion on hard topics that were once very hidden and that is progress. Progress usually comes about through small incremental steps and I feel like too often we are looking for some grand amazing change that we can all point to as success or failure. It’s more complicated than that, which I would hope we can realize is part of the reason why we must persist in our efforts. Thankfully, many amazing social workers and other change agents continue to persist and change the status quo. 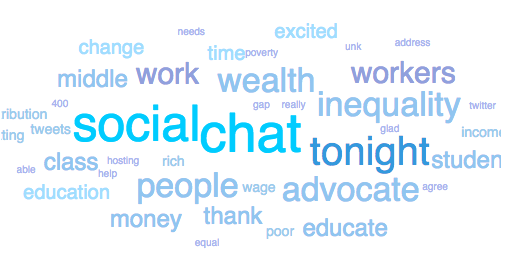 For example, #MacroSW now offers weekly Live Twitter Chats on a variety of topics. You have the opportunity to engage, listen, and work to enact positive social change. With a Twitter chat? Yes!!! Change has to begin somewhere and it starts with you, me, us. The problems facing society are great and complex, but that does not mean we should sit back, toss our arms up and simply give up. I understand that some get burnt out and that change is hard. Change is incredibly hard but totally worth it. I hope that you will join us this Thursday at 6pm Central/ 9pm Eastern Standard Time for a chat about Economic Inequality, but I hope that you will stay and become engaged in whatever topic you are passionate about because we need you, and if you are unsure about how to get engaged then just come and listen or “lurk” on the conversation until you are comfortable enough to engage. I hope you will find something of value with our community. My students sometimes give me the roll-eyed look when I talk about our profession being one of self-reflection. I know it’s true and I am confident that you can find many programs across the country that also have some sort of reflection-based assignment in one of their courses. Self-reflection is critical to the learning process. There is even a great journal focused solely on this subject called Reflections: Narratives of Professional Helping. Full disclosure, I have a recent publication in this journal 🙂 To this end I thought I would reflect a bit on the second semester of my first year at Cal State San Marcos. This semester has been full of working with students on their culminating experience, which is either a capstone project or Thesis. I had the opportunity to chair several projects and be part of others. These projects focused on veterans, homelessness, and social media in clinical social work practice. I’m sure the students might share a different perspective, but I enjoyed the opportunity to work with them. It was challenging at times and yes I am exhausted but that could be due to the fact that I haven’t read that much paper since my dissertation phase. These projects turned out rather well and gave me a renewed sense to pursue some avenues of research I was becoming dis-interested in. For example, one group focused on developing an advocacy campaign around homelessness. See the trailer below. I was truly amazed at how well this project turned out and extremely pleased with the learning demonstrated by these, and all students. Another example of some great student learning through reflection happened in my macro practice course. I employ a critical thinking presentation assignment and pretty much leave it open to the students to create a presentation that demonstrates their learning as it applies to one or more of the course learning objectives. These objectives are also tied to the learning competencies set forth by CSWE. Students did an amazing job this semester thinking critically and reflecting on their learning. I use twitter in this class and I had students create presentations that used some of the twitter assignment that they completed in class. 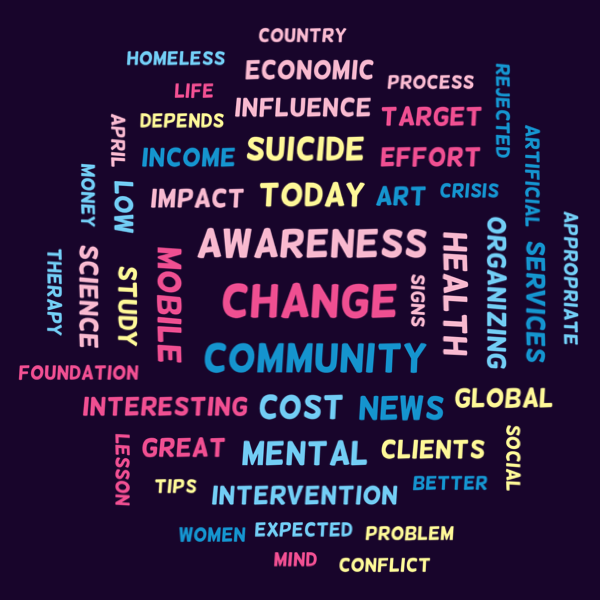 One particularly creative use of this was developing a word cloud of the course hashtag from the semester’s tweets and talking about how it related to their learning. If you are interested in creating word clouds you can use a number of different web-based platforms such as http://www.wordle.net/ or applications like TweetRoot. I really like the word clouds because they also represent a form of data visualization where the larger words represent the number of times those words were used. It is reassuring to see my students tweeting messages, links, and other content related to community, awareness, and change. These are things that definitely make up Macro Social Work practice. Dr. Laurel Hitchcock and I are once again partnering with #MacroSW to have a discussion about Income Inequality in America. We have used this innovative assignment and engaging documentary for a couple years now and even published some of our findings in Social Work Education: The International Journal. I hope you will join us this Thursday at 9pm Central, 6pm Pacific Time as we organize around the #MacroSW hashtag on Twitter to talk about this important issue. Also, please go and checkout the MacroSW blog for more information. Just a quick update as the beginning of my semester kicks off this week. I can’t think of a better way to start than with news of my latest publication with Laurel Hitchcock about our Live Twitter Chat assignments we have been using for several years now. The article is free for the first 50 people who access this link http://www.tandfonline.com/eprint/mYvhnQ4e6C4DrRYAUbF5/full but I know Laurel will also have some eprints available. We have written on our blogs several posts about this assignment and you can see a collection of my own posts here (hopefully the link works). This project has been lots of fun and I really enjoy seeing the students learn from this assignment. We will be partnering with #MacroSW chat once again this semester for our live chat so stay tuned for another blog post later in the semester. 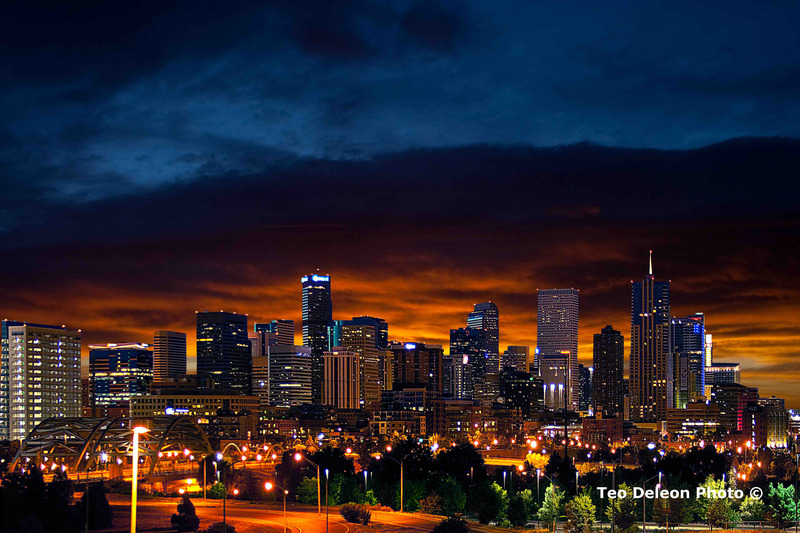 The Annual Program Meeting of the Council on Social Work Education takes place in Denver, Colorado this year and I am excited to be attending this wonderful conference. This conference affords me the opportunity to meet new colleagues, catch up with old friends, and begin new collaborations. Yes, I am also presenting some of my research and scholarly activities regarding the use of social media in social work education, but I mostly look forward to networking with others. At this years conference I will be participating in two different presentations, one a panel regarding online social work education and another regarding the Twitter Chat Assignment developed by myself and Laurel Hitchcock. I have written many times before on these topics here on this blog as well as published several articles on the broad topic of social media, but more on that later. The first presentation is all about engaging students in online education. I am presenting with several colleagues; Melanie Sage, Andrew Quinn both of the University of North Dakota, and Dale Fitch from the University of Missouri. We previously present on this topic and I also shared a blog post regarding that presentation. I hope to add in a bit more regarding the use of social media to further engage students in online learning in unique and innovative ways. I hope you can attend, but if not, I will try and get another blog post up after the conference. The second presentation is focused on using Live Twitter Chats to meet macro/policy social work objectives. Laurel and I have been working together on this assignment for several years now and currently have a piece in the process on evaluating this assignment. Students have really engaged in this and we are excited to continue working to refine and improve the assignment, more to come on that as well. If you are in Denver during the conference, I hope to see or meet you. If not, you can always reach out to me via Twitter @JimmySW if you have questions or want to say hello. One of these conferences I do think we need to set up a Tweetup to get all the social workers on Twitter together at one time. That would be fun. I believe Laurel will post a follow up to this chat on her blog as well but I wanted to share some quick stats on the event last night. In all we had just under 100 users on Twitter engaging around the topic of Inequality and over 730 posts. We had users from many different states and several countries represented. All these stats come from the website Keyhole and so I’m not exactly sure how accurate they are but one thing I did like from the site is this really cool word cloud of some of the top Keywords. I’m not sure that the widget will come through when I publish this post so here is a screen shot. This assignment has been really fun and even eye opening as I read through student’s reflection papers and I am constantly amazed at how much the students learn and recognize that Inequality is a real challenge and that they feel like the CAN do something about it. Stay tuned as Laurel and I continue to update and adapt this assignment. We have started gathering a bit more data and hope to share the results in the not to distant future. 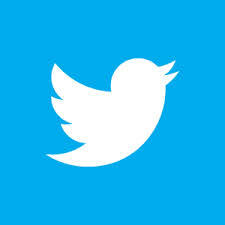 Understand how the social media platform Twitter can be incorporated into assignments for social work policy courses at the BSW-level. Demonstrate how social work educators can assess attainment of competency among BSW students using a social media assignment paired with a Rubric for evaluation of the assignment’s learning outcomes. Appreciate the role of professional collaboration in the development, implementation and assessment of social media-based assignments. Here is a link to the Prezi that we will show during the presentation (http://tiny.cc/SMAssignment_BPD2015). Our next live Twitter chat for this assignment will be on March 12, 2015 9 PM EST/8 PM CST and we invite you all to join us. The chat is sponsored by #MacroSW. Click here for more details. Social media includes applications, digital technologies, and mobile devices that utilize the Internet in a manner to create an interactive dialogue among organizations, communities, and individuals (Richardson, 2006). More specifically, social media are defined as an array of digital technologies that allow for the creation and exchange of user generated content (Kaplan & Haenlein, 2010; Kanter & Fine, 2010). Irrespective of the variety of terms and definitions, the role of the user as an active participant of interaction with others is paramount when describing social media (Kilpelainen, Paykkonen, & Sankala, 2011). There is a growing awareness that social work practitioners, students and educators need to be adept at using social media and information communication technology as part of their practice and interaction with clients and organizations of all sizes (Coe Regan & Freddolino, 2008; Getz, 2012; National Association of Social Workers [NASW], 2005). However, technology in social work education has been integrated sporadically with varying degrees of success, and the literature suggests social work educators need to increase their digital competencies or media literacy while carefully considering how and why to integrate technology into their courses and curricula (Hitchcock & Battista, 2013; Straub, 2009; Young, 2014). By doing so, educators can play a pivotal role in helping students to increase their own media literacy, and ultimately apply this knowledge to their own learning and subsequent practice. This workshop will inform participants about the development, implementation and assessment of a social welfare macro/policy assignment for BSW students using the microblogging platform, Twitter and a documentary film. The assignment involves social work students from four different universities spread across different parts of the country using Twitter to participate in a live chat about a macro/policy issue highlighted in the film, and is embedded as part of a policy and or macro-practice course. Through the assignment, students actively engage in competency-based practice behaviors connected to professional behavior, policy practice and critical thinking while also increasing digital media literacies (CSWE, 2008). Specifically, students are able to use critical thinking augmented by creativity and curiosity to convey their thoughts and reactions to the issue being highlighted (EPAS 2.1.3), and students understand that policy affects service delivery. Students are able to engage in policy practice through this assignment by collaborating with others to advocate for policies that advance social well-being (EPAS 2.1.8). Student assessment of competency attainment is achieved through a rubric designed specifically for the assignment and implemented across multiple classrooms. Rubrics have been increasingly used to evaluate and promote student learning (Gezie, Khaja, Chang, Adamek, & Johnsen, 2012; Stevens, Levi, & Walvoord, 2012). The presenters will share their experiences in designing and executing the assignment along with data demonstrating how the assignment’s rubric assessed student achievement of social work competencies. Lessons learned from the project will be shared and implications for the implicit curriculum will be reviewed. curriculum. Alexandria, VA: Council on Social Work Education. do Baccalaureate Students Think? Journal of Teaching in Social Work, 32(4), 421-437. Baccalaureate Social Work, 18(special issue), 33-45. Kanter, B., & Fine, A. H. (2010). The networked nonprofit: Connecting with social media to drive change. San Francisco, CA: Jossey-Bass. Kaplan, A. M., & Haenlein, M. (2010). Users of the world, unite! The challenges and opportunities of Social Media. Technology in Human Services, 29(1), 1-12. Richardson, W. H. (2006). Blogs, Wikis, Podcasts, and Other Powerful Web Tools for Classrooms. Thousand Oaks, CA: Corwin Press. Feedback, and Promote Student Learning (2nd edition.). Sterling, VA: Stylus Publishing.